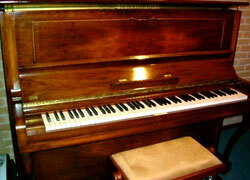 Have you ever imagined what the world’s most expensive piano is? Imagine no further. The most expensiv e piano in the world belonged to the Beatle’s John Lennon and was auctioned off to British pop-singer George Michael in 2000. When the topic of expensive pianos comes to mind you might think somewhere along the lines of a Bosendorfer, or a Bechstein, or maybe a Steinway & Sons “Alma-Tedema”, with its lavish artwork and hand crafted symmetry. But the Steinway & Sons “Model Z” Piano formerly owned by John Lennon is a fairly ordinary walnut upright piano that still bears a few cigarette burns attributed to the musician. The piano was originally bought by Lennon in December 1970, and delivered to studios at his home in Tittenhurst Park in Berkshire, England. He composed and recorded the song “Imagine” on it, and was filmed playing the song on it for the first time to wife Yoko Ono and the Plastic Ono band. Believed to be a piece of British history by many, the most expensive piano in the world sold at auction in the year 2000 for £1.45 million (about $2.1 million) dollars to George Michael after a “who’s who” bidding war that included several other British celebrities. Kopi Luwak the most expensive coffee in the world does exist, and those who drink the expensive coffee insist that it is made from coffee beans eaten, partly digested and the n excreted by the Common palm civet, a weasel-like animal. You would know if you drank the most expensive coffee in the world, because the quantities of it are tiny amounts. The Japanese government estimates the Earth Simulator cost $400,000,000, making it the most expensive computer ever built. The budget for the Earth Simulator project was authorized for the National Space Development Agency of Japan (NASDA) and the Power Reactor and Nuclear Fuel D evelopment Corporation (PNC) in 1997, and NEC Corporation made the winning bid for the Japanese project. By May 2002, the 640 processor node supercomputer was benchmarked with Linpack as having 35.86 TFlop/s performance. 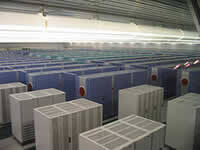 This gave it the top spot on the TOP500 Supercomputer Sites list until 2004 when IBM’s BlueGene/L supercomputer took its place using an architecture that cost less than half as much to implement. Each processor node in the Earth Simulator contains 8 vector processors running at 500MHz with 16GB of shared memory, and the total main memory in the machine is 10 terabytes. The operating system running on the supercomputer is NEC’s UNIX-based OS called “SUPER-UX” which is used on NEC’s SX Series of supercomputers. This expensive computer is used for a wide variety of international projects, most of which are related to atmospheric, climate, and oceanographic simulation. From Italian company Keymat Industrie comes an expensive television studded wi th 160 real diamonds, 20 carats. 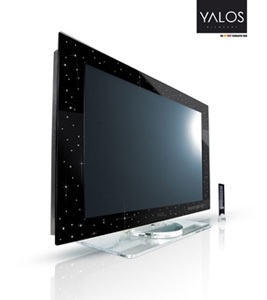 Costing €100,000, the Yalos Diamond is the most expensive TV in the world. This expensive TV has no visible screws or welds, and the aesthetics are the work of Japanese designer Takahide Sano. Not everyone can afford such an expensive LCD TV, but for those who absolutely must have the world’s most expensive television, the Yalos Diamond is the current choice. If you were thinking of upgrading to your first HDTV, this may not be the best option, but if you are remodeling your mansion, consider this expensive TV set. A Moscow-ba sed company has begun production to supply people who desire an expensive mobile with what has been reported as the world’s most expensive cell phone. 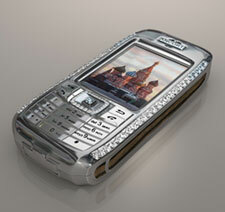 Along with the luxury look, this expensive phone manufactured by the Moscow-based JSC Ancort Company uses powerful encryption technology to for enhanced security. Luxury accessory producer Peter Aloisson has created the The Diamond Crypto Smartphone. This expensive cell phone is priced at $1,300,000 USD, and what makes this most expensive cell phone in the world cost so much? Apart from the platinum body this expensive mobile phone features a cover adorned with 50 diamonds including ten which are a rare blue diamond. The Ancort logo and the navigation key are made of 18 carat rose gold. Built on the Windows CE, the most expensive cell also features a high-resolution color TFT display and a 256 bit cryptographic algorithm. This expensive mobile phone is capable of SMS, MMS, E-mail, Internet, WAP, JAVA support and also has a media player. If your McLaren F1 is becoming a bore it might be time to check out the long awaited Veyron from Bugatti. At 1.25 million, it is the most expensive car ever made. So what do you get for all that money? How about a W-16 (essentially two narrow-angle V-8s sharing a crankshaft) with four turbochargers generating 1001 hp, throw in all-wheel drive and you’ve got a seriously fast car. The Bugatti Veyron 16.4 hits 60 mph in 2.5 secs., does the quarter-mile in 10.5 secs. and reaches its top speed of 252 mph in just 55 secs. After a long absence from the market Bugatti (with a little help from parent company Volkswagen) has reclaimed its title as the ultimate car. The mp3 player has one gigabyte of memory, a battery life of 25 hours, and supports MP3, WMA, WAV, ASF, OGG audio files. But what really makes this an expensive mp3 player is the exterior. 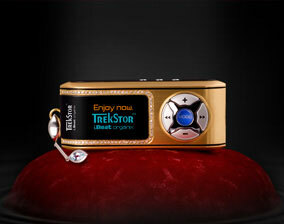 The TrekStor MP3 player i.Beat organix Gold is cast in 18 carat gold and adorned with 63 diamonds (one carat). The gadget also has a modest chain ornamented with aquamarine gems. The exclusive, unique player was presented to the public for the first time at CeBIT, the world’s largest IT trade fair in Germany. Jewelers Wenthe in Mannheim/Germany put over 100 hours of meticulous handcraft into the most expensive mp3 player making it an exquisite piece of jewelry. This mp3 player may never become the most popular, but TrekStor has recently decided to produce a limited series of this magnificent gadget for those who would buy the most expensive mp3 player in the world. 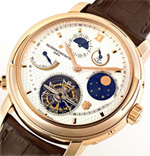 The Swiss watchmaker Vacheron Constantin marked its 250th anniversary in 200 5 with the world’s most expensive watch. Its name refers to one of the historical sites of the venerable company, located next to the current Maison Vacheron Constantin on the Quai de l’Ile. At $1.5 million, this is the most expensive watch this year. The popular worker’s denim trousers have become modern day fashion and status symbols. Designer jeans come in and out of popularity but in early 2000’s, expensive jeans started coming back into fashion with brands such as APO Jeans, Chip and Pepper, Paper Denim & Cloth, Seven for All Mankind, True Religion and many other brands costing $200 or more per pair. The Guinness Book of Records lists a pair of Gucci genius jeans featuring elaborate feathers, beads, rips and buttons as most expensive jeans off-the-rack at a cost of $3,134. But recently Forbes has showcased Escada’s Swarovski crystal-encrusted expensive jeans which sell for $10,000 US. Levi Strauss Company bid $46,532 to buy a pair of their own brand jeans back on the popular auction site eBay. The most expensive jeans were an average pair manufacturered in the 1880s and Levi’s must have considered them a historical brand artifact. “Blackie”, Eric Clapton’s favorite mid-career modified Strat has been surpassed in value and is no longer the most expensive guitar ever, despite that it was bought for $950,000 USD in 2004 by a guitar archaeologist. The latest most expensive electric guitar in the world dethroned its predecessor at an auction in Doha, Qatar on November 16th, 2005. The Strat was signed by several rock musicians to benefit a tsunami charity, ‘Reach out to Asia’. It was bought one year ago by Qatar’s royal family for a million dollars and donated back to the Asia Program, bringing in $2.7 million USD at the more recent auction, whose attendees included Former President Bill Clinton. Technically, the guitar has generated a total of $3.7 million USD, making it the most expensive guitar yet. Signees of this expensive electric guitar included Mick Jagger, Keith Richards, Eric Clapton, Brian May, Jimmy Page, David Gilmour, Jeff Beck, Pete Townsend, Mark Knopfer, Ray Davis, Liam Gallagher, Ronnie Wood, Tony Iommi, Angus & Malcolm Young, Paul McCartney, Sting, Ritchie Blackmore, Def Leppard, and Bryan Adams, the coordinator of the project.